Sacubitril/Valsartan (Entresto) for Heart Failure | The Medical Letter, Inc. ADVERSE EFFECTS — Hypotension and hyperkalemia were the most common adverse effects in the clinical trial; symptomatic hypotension occurred in 14% of patients taking Entresto, even though the study excluded those with baseline hypotension. Cough (11.3%) and elevated serum creatinine (3.3%) occurred in patients treated with the combination, but less frequently than with enalapril. 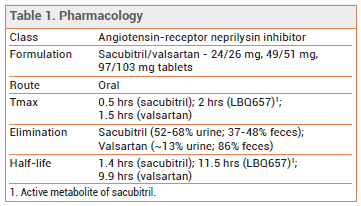 Neprilysin inhibition can cause angioedema, which occurred in 0.5% of patients treated with the combination compared to 0.2% of those treated with enalapril. PREGNANCY — ARBs should not be used during pregnancy because they can reduce fetal renal function and increase fetal and neonatal morbidity and death. DRUG INTERACTIONS — Concurrent use of Entresto with an ACE inhibitor is contraindicated because of the risk of serious angioedema, which occurs more often in black patients. Concurrent use of the combination with potassium-sparing diuretics or potassium supplements could lead to hyperkalemia, especially in patients with renal impairment, diabetes, or hypoaldosteronism. Worsening of renal function and acute renal failure could occur in patients taking Entresto and NSAIDs concurrently. Lithium toxicity has occurred in patients taking lithium and an ARB. DOSAGE AND ADMINISTRATION — The valsartan salt in Entresto is different from the one in Diovan; 103 mg of valsartan in Entresto is equivalent to 160 mg of valsartan in Diovan. The recommended starting dosage of Entresto is 49/51 mg twice daily. The dose should be doubled after 2-4 weeks as tolerated to reach the target maintenance dosage of 97/103 mg twice daily. ACE inhibitor treatment should be stopped for 36 hours before starting treatment with Entresto. 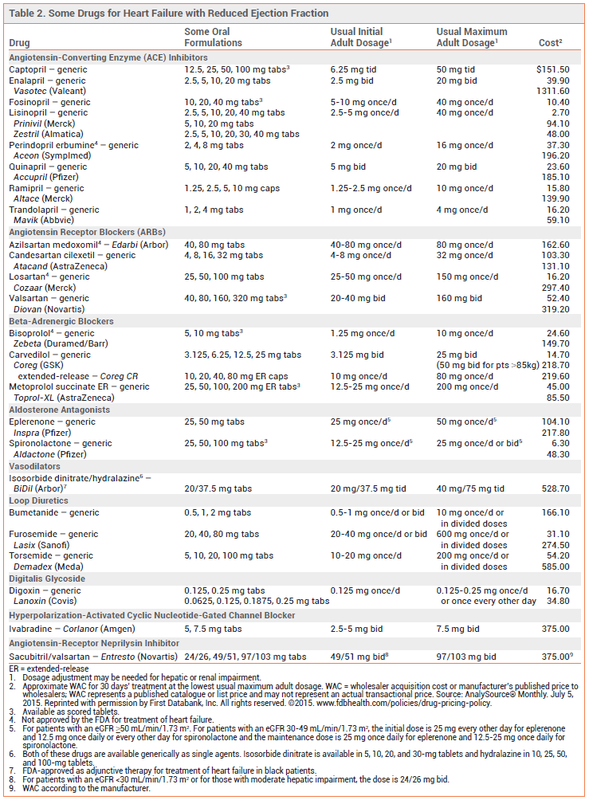 For patients not currently taking an ACE inhibitor or an ARB, or for those with severe renal impairment (eGFR <30 mL/min/1.73 m2) or moderate hepatic impairment, the starting dosage of Entresto is 24/26 mg twice daily. The dose should be doubled every 2-4 weeks as tolerated to reach a final dose of 97/103 mg. Entresto is not recommended for patients with severe hepatic impairment. CONCLUSION — Entresto, a combination of the neprilysin inhibitor sacubitril and the ARB valsartan, was significantly more effective than the ACE inhibitor enalapril in reducing the rate of death from cardiovascular causes or hospitalization for heart failure in patients with heart failure with reduced ejection fraction. It should be considered for use instead of an ACE inhibitor or an ARB for first-line treatment of heart failure with reduced ejection fraction. Hypotension and angioedema could be problematic. JJ McMurray et al. Angiotensin-neprilysin inhibition versus enalapril in heart failure. N Engl J Med 2014; 371:993. M Packer et al. Angiotensin receptor neprilysin inhibition compared with enalapril on the risk of clinical progression in surviving patients with heart failure. Circulation 2015; 131:54.